Weston’s MP John Penrose has welcomed a significant half-a-million pound investment in North Somerset mental health services for children and young people. John then met health chiefs at the Clinical Commissioning Group (CCG) and North Somerset Council repeatedly, to push for action. 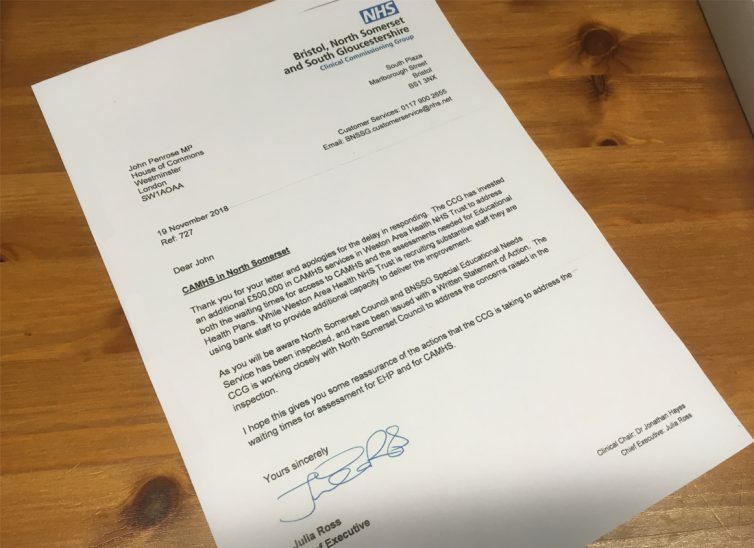 Ofsted and the Care Quality Commission (CQC) inspected the service, demanding improvements after finding ‘significant areas of weakness in the local area’s practice. And then a report from the Children’s Commissioner found that almost two thirds of those in North Somerset referred for mental health diagnosis (62%) were sent away without treatment compared to England’s average of just over a third (37%).